S. A. Mahan lives in the mountains of Colorado with her husband of 40 years. She dreams of stories while hiking the Rocky Mountain trails, and then returns to her mountain home to write them. She has 3 children and 6 grandchildren. She raises alpacas, enjoys the fiber arts, and is an avid outdoorswoman. She would love to hear from you via Facebook or Twitter. S. A. Mahan's books include The Baby Sea Turtle, finalist for the Colorado 2015 Book Award in children's literature, Chrissie's Run, finalist for the Dante Rossetti Young Adult fiction award, and A Pigeon's Tale, which has received a Blue Ink Star Review and was selected as a Blue Ink Best Book of 2016. In A Pigeon's Tale by S.A. Mahan, a baby pigeon was forced out of the coop before he was ready, into a dark night full of ruthless predators. Away from his family, he flew alone in search of a safe place to call home again. After a very tough journey, he finally found his home with a flock of pigeons in a far away town. Young Squeaker was taken in by the leader of the flock - Old Dude - who would go on to raise him as his own and teach him great life lessons. Under Old Dude's strict orders, Squeaker would later leave his new family in search of a human family. Squeaker's wonderful journey started at old George's farm, to his next pigeon family under Old Dude's protective wing, to his goose family and then to the most exciting chapter with his human family. Come follow the brave pigeon as he learns about life and takes on endless challenges; and be a witness to his mighty role in saving the world from extinction. 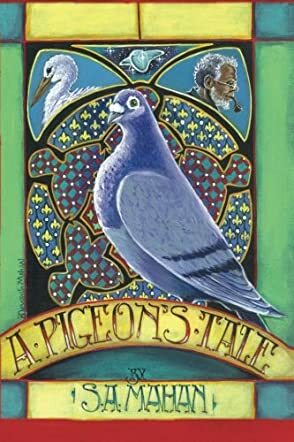 A Pigeon's Tale by S.A. Mahan is an immensely inspiring tale about life, love, kindness and courage as seen through the eyes of a mighty brave pigeon. S.A. Mahan's flawless writing brought this beautiful story to life through a style that was fun, natural and just right for the theme. It is amazing how these contrasting characters were blended into one compelling story. The book portrays the most beautiful, most caring and most inspiring relationship between Squeaker and Old Dude, Squeaker and Henry, and then Squeaker and his human family. It was simply incredible the way Old Dude and those after him took the young pigeon under their protective wing like he was their own blood; it is the kind of love I wish existed for the countless abandoned and suffering kids around the world. The story is a one of a kind children's book with great lessons for children and for adults too. From kindness and being good to one another - even to complete strangers - to listening to the wisdom of the elders and believing in God, to sustainable energy, we can all learn a lot from this moving story. A Pigeon's Tale by S.A. Mahan is one of the most flawless and compelling children's books I have read. A Pigeon's Tale by S.A. Mahan is the cute little story of a young pigeon called Walter, who has the responsibility of leading his human friends to safety from the destruction of the Big One. Walter escaped the claws of a wildcat and finally finds a human family who takes care of him. Walter also has to find ways to survive the Big One which going to end the human race. Sir Alfred Jerome, his human friend who is also a scientist, has built a shining city in the sky, Skynest, to save the children from destruction. Alfred Jerome will need Walter's help and also that of the Great White Stork to save his granddaughter, Dottie. Will Walter be able to help? Will Walter emerge to be the hero in this survival game? This story will captivate not only children, but also adults. Its a classic story with a lot of fluid movements that make it fast paced and exciting for readers. The plot has many layers that keep the interest going till the very end. Readers get to know more about pigeons and their history by the time they complete the book. It throws light on the pigeon like never before. The story is well written and Walter Pigeon's character is memorable. Children will love Walter. The educational side of the story is also useful for kids to improve their knowledge about pigeons. It's a delightful book worth reading. A Pigeon's Tale by S.A. Mahan is the epic story of a homing pigeon forced from his home who ultimately becomes the hero of a natural doomsday not too far in the future. His education by Old Dude begins his journey, which leads him to human friendships with scientist Grandpa and eight-year-old Dottie, who communicates with him through a computer. Walter Pigeon, also known as Squeaker, also known as Professor, tells this tale from his past himself, typing it with his beak -- because he is that smart and special and the great-great-great-grandson of Cher Ami -- plus he has the collective knowledge of thousands of generations and morphic resonance, too. If you have a pre-conceived notion of pigeons as just the scavengers of the parking lot, be prepared to think differently by the end of this book. Author S.A. Mahan weaves pigeon facts and even some quantum physics with the development of a varied cast of characters and coming of age adventures, ultimately reaching a crescendo in an ending that is both frightening yet full of hope. I think this would be a great book for intelligent middle-schoolers with reading skills well beyond their grade level, but who still need a story within their emotional age. The book does include some scary and sad scenarios, but the fact that the story carries through them to the golden vision beyond is a lesson in itself. A Pigeon's Tale is in some ways so unique it defies categorization, but if I had to compare it to something, I'd say it's like Bambi and the Rats of Nimh riding through A Wrinkle in Time on Noah's Ark.